You’ve hear the word metabolism thrown around in health and fitness circles and most of the time they just use the word because it helps sell their products even if it has nothing to do with actually boosting your metabolism. I actually found a great description of what the metabolism is and does from the Better Health Government Website. Metabolism refers to all the chemical processes that go on continuously inside the body. Your metabolism is influenced by your age, gender, muscle-to-fat ratio, the food you eat and physical activity. Your hormones and nervous system control your body’s metabolism. Hormonal metabolic disorders include hypothyroidism and hyperthyroidism. These processes include those that break down nutrients from our food and those that build and repair our body. Building and repairing the body require energy that ultimately comes from your food. The amount of energy, measured in kilojoules (kJ), that your body burns at any given time is affected by your metabolism. Thermic effect of food – the energy you use to eat, digest and metabolise food. It contributes about 5-10 per cent of your energy use. Here’s 3 major mistakes which will DAMAGE your metabolism and therefore slow down your fat loss and health . Stop Wasting Time Doing Long Boring Steady State Cardio! I know you are thinking this guy is crazy…. well let me explain.. There are better ways to burn fat without spending hours and hours pounding the pavement, plus most importantly you need to avoid the damaging hormonal effects of low intensity steady state cardio. We are going to discuss why most people need to change their workouts completely so they can finally start getting results and get off the crazy cardio hamster wheel. Now, can you use long duration cardio to lose weight? Yes you sure can. However what we want to do is use the best techniques to get the fastest results and for that it’s strength training. 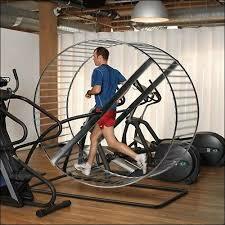 My tip is to stay away from steady state cardio unless you are training for a marathon or a long duration event. If you are training for running events of course you need to add some long distance cardio as it helps increase the blood volume your heart can pump per beat and improves your VO2max. A problem with long workouts is your body adjusts by becoming more efficient so it can withstand and improve your long cardio sessions. Eventually, you find you have to workout even longer to burn the same amount of calories or you start gaining fat again. Does this sound like something you may be going through? Do you feel you have to workout longer to stay thin or if you miss a workout the fat and weight gain is a really fast process? What we need to do is start strength training because excess Low Intensity Steady State Cardio and dieting makes you look skinny fat which means you have a high percentage of body fat compared to muscle. 60kgs with 10% body fat looks different that 60kgs with 35% body fat.One person will look great naked and the other will look flabby. Something I hear people say all the time is muscle weighs more than fat? Well sorry to burst your bubble but it actually weighs the same. 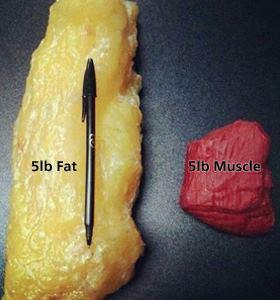 5kgs of fat weighs the same as 5kgs of muscle. (Yes I did pass math in Grade 4 thanks Mr Farrow). Why most people get confused is because muscle is more dense than fat. So you can weigh the same but look completely different. You want more muscle because muscle uses fat at rest as a source of energy plus muscle is what shapes you. Fat makes you look flabby so you want to build muscle and have a greater muscle to fat ratio. 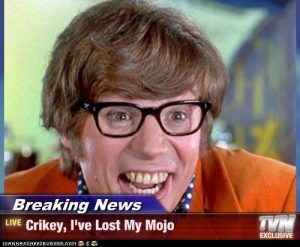 Going on yoyo diets makes us lose weight, not just fat but muscle too and therefore when you are naked you look flabby and that ain’t cool. Resistance Training adds shape to your body and don’t worry, you will not bulk up. The reason you bulk up is because of your diet not because you lift weights. Instead of concentrating on small isolated muscle groups what you need to do is train using the most bang for your buck exercises. Multi joint exercises like squats, deadlifts, presses, chin ups etc. these exercises will really turn up the fat burning process. Now does this mean you should not train muscles in isolation? No as it is a very important part of the process..
A correct program should incorporate strengthening your weaknesses to not only keep you injury free but to improve your results. That is why spot training is beneficial no matter what you hear. I MUST emphasise that it is important to get a workout that is personally designed and not a cookie cutter approach as you must perform the exercises which are right just for you. Your goal is not to be the best at exercising but to utilise exercises that are individually chosen just for you to get results. The right exercise and nutrition for one person could actually make someone else’s results go backwards. Plus what also needs to happen is to avoid your body adapting to the workouts. To do this you need to vary not only the exercises but the tempos and rest periods.This helps our body burn more calories. Also one thing I see is that most people don’t train at the right intensity. Some people need to train at a higher intensity and some other need to reduce it, it’s all person specific. In fact if you train at high intensity when your body is not physiologically ready for it can hurt your results dramatically. Please remember you cannot out train a bad diet and if you are training you need to make sure you’re eating correctly to fuel for your body so it can recover. This means you have to protein and carbs as well as fat. Do yourself a favor — allow your body to start working for you, not against you that is why we use cardio methods that boost your metabolism for 24-72 hours after your workout not reduce it.